Tags are labels you can add to your tasks that sort them into categories. 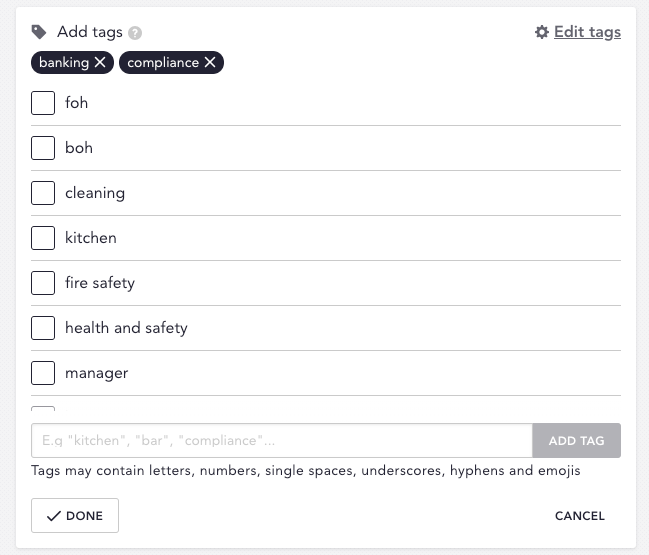 With tags you can filter Trail so each team and person will only see tasks that apply to them, helping them get the job done quicker. From the task edit page, open the Tags section. Click "Create a new tag" it to bring up the text box, where you'll be able to fill in the tag you want to create. For example, "Kitchen". Click "Add Tag" when you're done. You'll now see the tag you created in the box, with the text box below it (allowing you to create more if you need to). If you change your mind about a tag on a task, you can uncheck it by clicking on it. It will still be available to all your other tasks, but won't be attached to this particular one. Now all you need to do is click "Save & Close" at the top of the page, and you're done. Those tags will be available for each site in the filters at the top of their task list.